When we stumbled upon this car, we thought it was just your regular 12-second Duster. Small tires, stock looking and a parachute? That has to be for show – right? Wrong! This ’73 Duster was tuning for an upcoming index race. The graphics immediately catch your eye, but the presence of an eight-second small block does not tip its hand until you watch it hold the front wheels in the air for at least the first 60 feet. Mike Ziccardi is your typical Mopar man. He brought his entire family to the track, and it was definitely a family affair. These kids have no choice but to follow in Dad’s footsteps, and are they lucky! 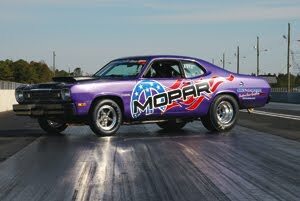 Most Mopar guys are not typically followers since having a Mopar in general makes you a leader. “I am a Mopar enthusiast by birthright,” he said. “I was raised idolizing my father’s 1968 GTX 440 race car. Mopar was in my blood from the get-go. Back then, it was Rapid Transit or Direct Connection by the time I was born in 1974. “I got my first Duster in my senior year of high school. My uncle had one for me in Pennsylvania, and all I had to do was drive two states away and pick it up. After many attempts of trying to turn it into a race car and a lot of blown engines, that car would eventually make it out of my life. I ran across an advertisement at a local speed shop for a 1973 340 Duster. I went and looked at the car and decided this original 340 Duster needed to be mine. I was 18, broke and working at my family’s sign company. I asked my boss, back then my dad (now my wife Theresa and four children Nico, Vincent, Christina Marie and Dominic), for an advance of pay for the next four weeks so I could buy my new Duster. He agreed after some groveling. “The car was brown with a white interior. Within the first year of owning it, I had the car painted purple, installed a roll bar, put some X heads on it, and a little nitrous. Needless to say, the nitrous got the best of the engine after a short while. A couple of rebuilt engines later, I had my first P600 Procharger hanging off the side of a 340 Mopar. At the time, this was pretty much unheard of. You only saw Mustangs or Chevys with Prochargers on them. No brackets existing to do anything else. “Eventually, I got the car to go into the high 10s on that combination. After that engine let go, I contacted S&D Concept Engineering (SDCE) in West Warwick, Rhode Island. I contracted with them to build my next small block with a D1 Procharger with a blow-through carburetor. We eventually got this combination into the high nine-second range. At this point, the car had to go out to Tony Giresi Race Cars, in Deer Park, New York, for a full NHRA cage, parachute and a downforce wing. I needed to obtain my NHRA competition license as well, which I did. After a few seasons of dragstrip and mild street use, we needed to retire the old 340 engine that was currently in the car. Once again, I contacted SDCE. This time, we opted to build a fuel-injected small block with a F2 Procharger head unit and air-to-air intercooler. This combination was good for 1,050hp at the crank on a moderate tune, not spinning the engine over 7,000 rpm. Engine: 383 cid, Mopar R3 small block standard 59 degree cam. Custom reverse cooling system. Power Adder: SDCE blower System part number 875-1000 (12-rib supercharger system with ATI Procharger F2 head unit). Interior Mods: Racing buckets, no back seat, rest of original interior there including all door panels, carpet, dashboard, and headliner. Paint: Plum Crazy body color with flat black hood, wing and bumpers.